Pressing Ctrl + Alt + Del keys together brings up screen with lot of options including: Lock this computer, Switch User, Log Off, Change Password and Start Task Manager. If you want to perform either of routine while working on Windows PC, just press Ctrl + Alt + Del keys to get that options screen. However, in certain cases – you may want to disable access to specific options on Ctrl + Alt + Del screen. For example, if kids are using computer – you may want to remove Change Password and other options. Using Tweak Ctrl + Alt + Del options tool and few simple clicks – you can easily disable and remove any option from appearing at that screen. 1. 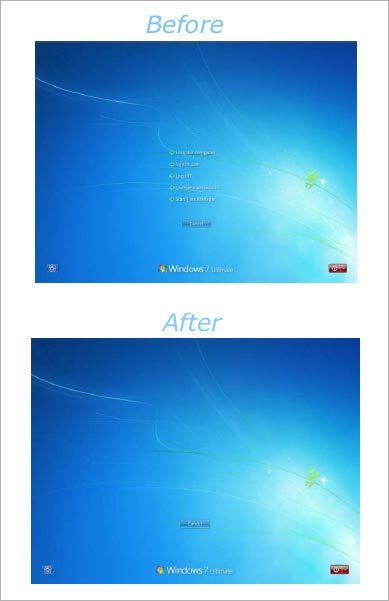 Download Tweak Ctrl + Alt + Del options tool on your computer. Once the Zip file is download, double click to extract contents in a folder. 2. Then open the folder and double click editctaldl file to launch this utility. Tweak Ctrl + Alt + Del is a portable tool and hence does not require any installation. 3. You can click to disable any of the options disabled on Tweak Ctrl + Alt + Del window. This includes: disable lock this computer, disable change password, disable switch user, disable task manager and disable log off. 4. Click on OK button and the selected option will be disabled and removed from the Ctrl + Alt + Del screen. 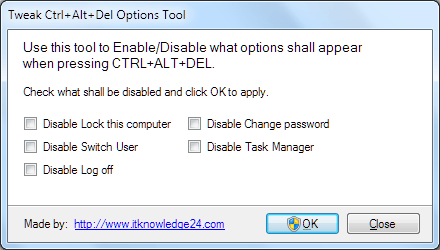 You may chose to disable all or few options available on Ctrl + Alt + Del screen using portable Ctrl + Alt + Del tweaker tool.